A documentary film crew begins following Oliver while making a short movie about the rise of vigilantism in Star City. 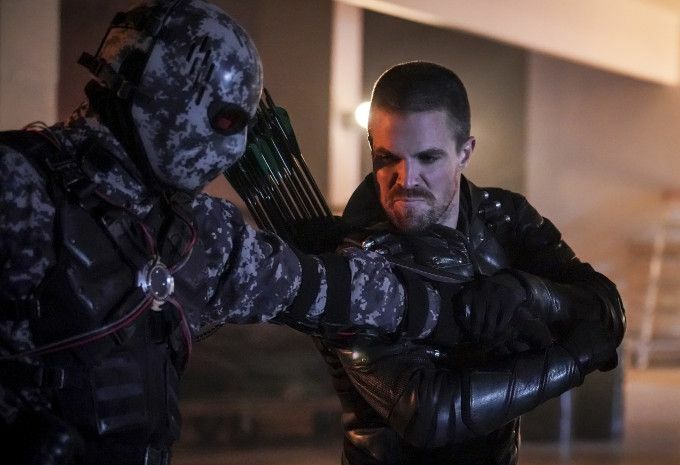 As Oliver and the former Team Arrow members try to do their jobs as the camera crew get in their way, they have to contend with a new threat - a vigilante hunter - as Oliver also prepares for William's homecoming. True Crime reality TV shows like COPS. It's unclear just how the immunity Team Arrow earned works in the face of the anti-vigilante law. Reference is made to the FBI making Rene's immunity from prosecution permanent. Is that just for him or is the FBI ignoring everything Team Arrow does from now on, leaving them to contend with the local laws? The use of shaky-cam during the action sequences where the camera crew is following Oliver is fantastic. The five-way fight scene between Chimera and Ollie, Dinah, Curtis, John and Rene is fantastic. The episode title comes from the Green Arrow's alliterative nickname from the comics, much like how The Flash is known as The Scarlet Speedster. This is the 150th episode of Arrow. The episode opens with the WB Shield and the music that usually appears before a Warner Bros. film rather than a TV show. Kelsey Grammar, perhaps best known for playing the role of Frasier Crane on Cheers and Frasier, is the narrator of the documentary sequences. Sin's real name is revealed as Cindy Simone. This last name is doubtlessly a tribute to writer Gail Simone, who created the character of Sin for her run on Birds of Prey. The clapper used by the documentary makers contains the names of M. Pedowitz and J.D. Davison. The former is a nod to Mark Pedowitz - the President of The CW. The later is a camera operator, who shot this episode as well as Arrow's pilot. Chimera is revealed to be a man named Kevin Meltzer. This is likely a tribute to Green Arrow comics writers Kevin Smith and Brad Meltzer. The name Chimera has been used by several DC Comics villains in the past, but none of them have any connection to the Arrowverse version of Chimera. One was a Batman villain who was a master of disguise. Eve "Nightshade" Eden used the name Chimera as an alias while going undercover in the terrorist supergroup called The Jihad in Suicide Squad. A later villain with teleporting powers later took on Eden's costume and alias to become a second Chimera. The name was also used by Sanjeet Bhatia - a reality-warping hero who was an ally of the Teen Titans. Checkmate Agent Adam Sharp used Chimera as a codename. King Chimera was the alias of a magic-wielding member of the Justice Society. Finally, in the reality of the New 52, Chimera was used as an alias by the Durlan Ra'ut L'lwer, who was another ally of the Teen Titans that possessed shape-shifting powers. The final scene reveals that Darkstar's first name is Mia. This seems to suggest that her full name is Mia Dearden. In the comics, Mia Dearden was a teen prostitute, first appearing in Green Arrow #2, after Green Arrow rescued her from being raped by a councilman. This inspired her to fight back against her pimp and led to her accepting Oliver Queen's offer of a job at the Star City Youth Center and a place to stay. She later became the second Speedy and the chief inspiration for the character of Thea Queen on Arrow. Darkstar is accompanied in the final scene by a man she calls Connor. Connor is played by actor Joseph David-Jones, who played John Diggle Jr./Connor Hawke in the Legends of Tomorrow episode "Star City 2046". He seems to be recreating the role here. In the original Green Arrow comics, Connor Hawke was Oliver Queen's illegitimate son from an affair he had in college. His backstory largely inspired the character of William Clayton on Arrow. Felicity created a virus that infects anything that tries to log in to the WiFi at her and Oliver's new apartment. William detects it after finding a firewall breech and a Bluetooth incursion. Felicity is having trouble finding Emiko using surveillance and keyhole satellite technology.This leads Ollie to ask John if he can use ARGUS. Felicity set up an encryption scheme so that Will could keep texting Zoe Ramirez while he was away. Chimera's armor is military grade and Wayne Enterprise's design. It is powered by an exolithium power cell. Without that, whoever is wearing the armor can't even move. Unfortunately, the cell is electromagnetically shielded so it can't be hacked remotely. Quentin Lance: Well, I'm - I'm conflicted about this. I'm not going to lie to you. I'm a police officer. Duly sworn. I don't condone vigilantes of vigilantism. Once people start taking the law into their own hands, you're on the road to anarchy. But there's worse things out there than anarchy. And sometimes, as much as I hate to admit it... the police aren't enough to deal with it all. Sin: I knew them back in the day. Canary. The Arrow. The whole crew. Honestly, I don't know where I'd be right now without them. They helped me out of a couple of pretty tight spots. I owe them a lot. But I- I saw the toll it took on them. Like, people like to debate about the legalities. But for the people wearing the masks - it's, it's not philosophical. It's real. And it takes everything from them. John: No, look. You don't become successful in my line of work without becoming really good at sizing people up, Trust me. Oliver Queen is no one's hero. John: Obviously this particular comment didn't age too well. Oliver: What do you think you were doing out there? Rene: Same thing you do. I'm doing good, by the way. Thank you for asking. Oliver: I'm glad you're okay. I'm glad the FBI made your immunity permanent. But being a vigilante is illegal in Star City. Rene: Well, that's easy for you to say. I mean, you have a cute, shiny new badge. Rene: Thought about giving one to anyone else? Dinah: First step would probably be not being so reckless. John: Oliver needs access to the Black Watch Satellites. Curtis: Is he supposed to know about thiso? (To Oliver) You know about those? Oliver: (sarcastically) You've met my wife, right Curtis? Wild Dog: Yeah, the mayor, the politicians - they might care about the city. But they don't seem to give a crap about the people in it. So are you really so surprised when people decide to do something about it? John: We may not have been Team Arrow when you were in Slabside but we had each other's backs Just give us a chance, man, to have yours..
Oliver: You could go to prison. John: So? You did it for us. Which never really sat right with me. And the reason why is that it wasn't right, Oliver. We have fights, disagreements, recriminations, but it doesn't matter because we are a team. And nothing's going to change that. Oliver: John, I made a lot of mistakes. John: We all did. That's why they're called mistakes, Oliver. You learn from them. You move forward. We... we get better. Oliver: Ricardo Diaz and his crew happened here. They couldn't stop us. We're coming back here. We'll rebuild. Gonna do it better this time. Director: Sounds like you have regrets about how you did it before. Oliver: Too many to name. A friend of mine recently told me that's why they're called mistakes. You learn from them. Move forward. Be better. Connor Hawke: Where did you get that? Connor Hawke: Yeah, Mia. That much I figured. But wasn't this documentary banned? I thought every copy was destroyed years ago. Blackstar: Not this one. It's total pro-vigilante garbage. But even garbage can be useful. Connor Hawke: Useful for what? Break-ins? You know what? Actually, the less I know about that, the better. Blackstar: Trust me, Connor. You are going to want to come with. The episode is presented as a real documentary in the world of Arrow, titled Emerald Archer: The Hood And The Rise of Vigilantism. Quentin Lance's comments on vigilantes are presented from archival footage from 2014. Thea Queen is interviewed about how her mother and brother, Tommy Merlyn, were killed by supervillains who were only brought to justice by vigilantes. Ricardo Diaz, interviewed in prison, says that vigilantes are hypocrites and the only difference between them and him is that he's smart enough to only worry about himself. Sara Lance is interviewed about her father's death and states her belief that people need to help people, whether they are wearing a mask or not. The documentary recalls how Oliver was officially deputized and shows footage of his capturing Max in 708. Sin, last seen in 312, is interviewed about how she knew all of Star City's vigilantes back in the day. William has gotten taller since Ollie and Felicity last saw him. He says he has outgrown the nickname "kiddo." M. Pedowitz has been making a documentary on vigilantes for years but couldn't get the funding to finish it until after Oliver Queen went public and became the world's first openly-operating superhero. Oliver asks for William to be left out of the film. The documentary shows footage of John Diggle being asked about Oliver being a vigilante from before he learned about Ollie's secret identity in 103. We then see the modern day John Diggle looking embarrassed about his past self saying there's no way Oliver Queen is a hero. Dinah Drake is interviewed about Ollie's current job. She says she doesn't see him as being different than any other cop, even if he wears a different uniform and carries a different weapon. Oliver freely admits that he never meant to wind up leading a team of heroes and he isn't sure he is a good leader. Dinah brings Oliver in on two strange murders where the victims had their throats cut. Dinah and Oliver respond to a report of shots being fired and possible vigilante activity. They find an unmasked Rene Ramirez in his Wild Dog costume. He tells them that the new Green Arrow was kidnapped. The FBI apparently made Rene's immunity from being prosecuted on vigilante charges permanent. This does not, however, (as Oliver points out) protect him from local anti-vigilante laws. Rene points out that crime went up after the vigilantes retired and Ollie went to prison but the crime in The Glades dropped after the new Green Arrow appeared. Rene says the kidnapper was wearing an exo-suit that looked like it was of military design. Mayor Pollard intends to hold a town hall meeting on vigilantism and force Oliver Queen to face the public and justify his job. William is bitter about being sent to boarding school and not being allowed to come home for Christmas. He was the only kid at the school who had to stay there. Oliver asks John to use ARGUS' Black Watch satellites to try and find Emiko. Oliver tells John that the new Green Arrow is his sister. Oliver has known about Emiko for a month. He apologizes for not telling John sooner but says they haven't exactly been running in the same circles for a while. Diggle says it has been almost a year but agrees. He is about to tell Oliver something (likely that he's recruited Diaz for the Suicide Squad) when Curtis enters. ARGUS tracks the new Green Arrow to the abandoned Starling City Athletic Club. Oliver keeps a digital lock-pick in a shoulder pouch in his costume. The mask-hunter has the masks of Rory Regan (Ragman), Rene Ramirez (Wild Dog), Helena Bertinelli (Huntress) and Emiko Queen (Green Arrow II) in his lair. Black Siren is interviewed. She says it's her opinion that vigilantes should not be allowed to operate because if they could do what they did lawfully, they wouldn't hide who they are. Rory Regan's identity is publicly known. He says he stopped wearing a mask but didn't stop doing good. Rory was last seen in 512. Apparently Oliver has some means of contacting him, but he does not respond when Oliver tries to call him over the course of the episode. Oliver also has some way of being able to contact The Huntress (last seen in 217) but he is not able to get a hold of her either. Rene Ramirez's identity as Wild Dog is publicly known. Curtis' identity as Mister Terrific is still secret. Barry Allen is interviewed about Oliver. He says he had no idea Oliver was Green Arrow until he turned himself in. Curtis gives the mask-hunter the name of Chimera. Using security footage from the abandoned club, Curtis is able to track Chimera to an abandoned building at 101 Federal Street in Star City. Oliver says that 101 Federal Street used to belong to Adam Hunt. Adam Hunt was the first person on his father's list whom Oliver went after in 101. Dinah is able to rescue Emiko while Oliver fights Chimera. Emiko says that Chimera is coming for Oliver. Will goes to Rene and Zoe's apartment, nominally to help Zoe with her geography homework. Will says there's something wrong but he doesn't want to talk about it. Zoe says he can just hang out with her if he doesn't want to go home. Zoe and Will promise never to fight when they can talk. Zoe says that her father and Dinah only fight now. Zoe calls Dinah Aunt Dinah. Emiko escapes from her hospital room. Emiko tells Rene that Oliver is her half-brother. She says she didn't tell Rene because she was afraid it would change their partnership. Rene asks why it would and confirms they are cool. Oliver tells Dinah that Emiko is his half-sister. Mayor Pollard thinks that Oliver and Dinah are making up Chimera to get him out of the town hall. Oliver refuses to appear as it will put people in jeopardy. John tells Oliver he thinks they can safely use the town hall to lure Chimera out and that he has a plan to handle him safely. Oliver says he can't risk John going to prison for breaking the anti-vigilante laws. John doesn't care, saying that Oliver risked prison for them and they need to return the favor. Dinah uses her Canary Cry in front of Mayor Pollard to stop a wall from collapsing on a fleeing crowd. Once Chimera is down, Mayor Pollard has Spartan, Wild Dog and Mr. Terrific arrested. Chimera is revealed as a man named Kevin Meltzer. Recently released from Roth Psychiatric Hospital, he was apparently obsessed with superheroes ever since The Hood saved his life seven years earlier. He just collected their masks as a weird form of tribute. Black Siren says she can decline to press charges against John, Curtis and Rene but the anti-vigilante laws will still stand. Dinah tries to resign from her job. Oliver also turns himself in, saying that if his team is going to jail, he should be with them. Mayor Pollard refuses to do anything to try and strike down the anti-vigilante laws but does allow Black Siren not to press charges. She then arranges for Spartan, Mister Terrific and Wild Dog to be sworn in as special deputies in the same way Oliver Queen was. William reveals that he was expelled from his private school. Felicity discovered he was lying about something after having made a fake mock-up of the school's website with fake mid-term results. Oliver Queen takes the documentary crew to the remains of The Bunker. He declares his intent to rebuild it and make the team work better this time. In the final scene of the episode, we see the documentary being watched by Blackstar from the flash-forwards in 708. She is addressed by the first name Mia. A dark-skinned named Connor is working with Mia. This character seems to be Connor Hawke (aka John Diggle Jr.), who was seen acting as the new Green Arrow in Star City in the year 2046 in L106. We are told the Emerald Archer documentary was banned as pro-vigilante propaganda years earlier and all the copies were thought to have been destroyed. Mia and Connor find the rebuilt bunker, which seems to have been built into a literal cave. Mia says that Star City's vigilantes got what was coming to them and that they were the death of Star City. Apparently Ragman and Huntress fought Chimera at some point in the past and had their own masks taken as trophies. A powerful anniversary episode that looks back at the past as it sets the stage for the show's future. While I wish we'd gotten more than a glimpse of certain things (i.e. what exactly happened to Sin, Ragman and Huntress) nearly everything here works perfectly. The one sour note is the reintroduction of William Clayton in the modern day, whose story is nowhere near as interesting as the show runners seem to think. Hopefully he'll be shipped off to another boarding school and never return to Star City in the future, as promised, in the near future.